If you're experiencing laptop problems and you're not quite sure how to fix the problems plaguing you, it may be a sign that you need laptop repair services. Here are seven signs that it's time to have your laptop serviced by a professional. If you're wondering whether it's time to replace your cell phone or bring it in for repair, then you should be prepared to know what cell phone repair cost is. Here we're outlining some details to help guide you to the repair shop and some other key pointers so you can know when to upgrade. Regardless of how safe you are with your phone, without a screen protector you're at risk of damaging your phone, in some cases beyond repair. Keep reading to learn why you should always have a screen protector on your phone. What are Your Options When Replacing an iPhone Battery? iPhone battery replacement can be confusing. Fortunately, you have options. Learn more here. Do you regularly back up your phone's data? If not, there are a variety of dangers that pose a threat to your data. Prominent examples include losing your cell phone, theft, and water damage. We recently helped a customer whose data impacted by a less frequent danger, fire! This Samsung Galaxy S5 caught on fire overnight while charging. The next day, it was like new. A customer’s Samsung Galaxy S5 caught on fire in the middle of the night while it was on the charger. Just before this situation occurred, a loved one had passed away, and there were many photos of them left behind on the device. Sadly, the images on the phone had not been backed up, so the customer was worried about losing the photos permanently. She called us and explained the situation, then brought the phone to our location on 144th Street. Within a few hours, our board-level specialist, Evan, had the phone working enough to retrieve the photos from it. He compiled the pictures into a zip file and shared the link with her. The customer was ecstatic to have the photos back, and we were so thrilled to provide a solution to a high-stress situation. 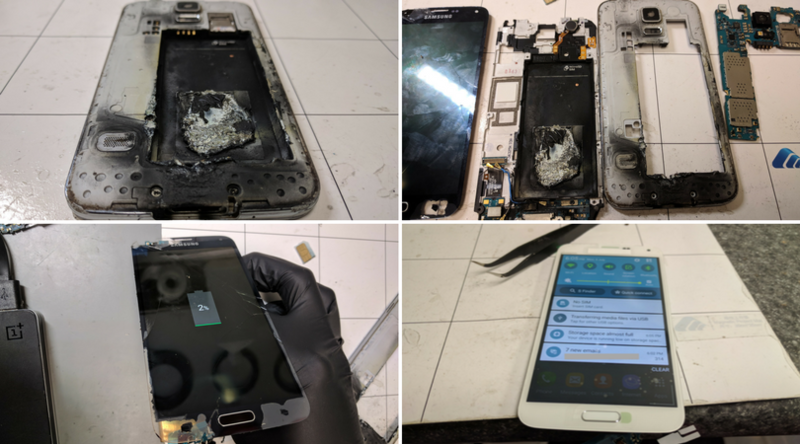 Hopefully, none of you have to experience what this customer went through with a with a phone catching fire, but if you find yourself with the same misfortune, you know we can help! At iFixOmaha, we’re all about saving people time and money on a broad range of repair. No matter what part of town you live in, there’s an iFixOmaha near you. Sometimes driving to one of our repair centers isn’t an option and in a repair emergency, our On-The-Spot service can save the day. Recently, we received a pleasant note from Cheryl, an On-The-Spot customer, whom we helped at the University of Nebraska Medical Center. 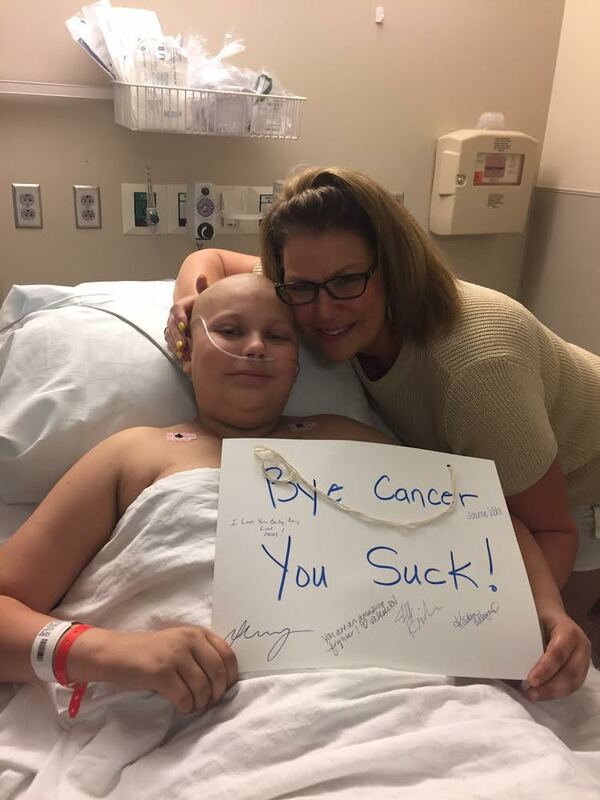 Cheryl’s 13-year old son was diagnosed with a rare form of cancer and needed a unique surgery, despite facing numerous difficulties in the process. As Cheryl was running into the hospital to meet her son and his team of doctors before they headed into surgery, she dropped her iPhone on the cement in the parking garage. Cheryl recalled seeing the iFixOmaha location on Cass Street and called to explain the situation. With our On-The-Spot Repair service, technician Mason arrived at the hospital within 30 minutes to replace the screen on Cheryl’s phone. Mason fixed the phone quickly, and Cheryl was able to meet her son before his surgery with 10 minutes to spare. Cheryl, we are so glad we were able to help you in the midst of a stressful situation by fixing your broken phone. We will be cheering on your son and your family as your son endures the battle against cancer. Give us a call at (844) iFO-ToGo to learn more about our On-The-Spot Repair service. "I wanted to pass along a personal note of thanks to your company and to Mason. 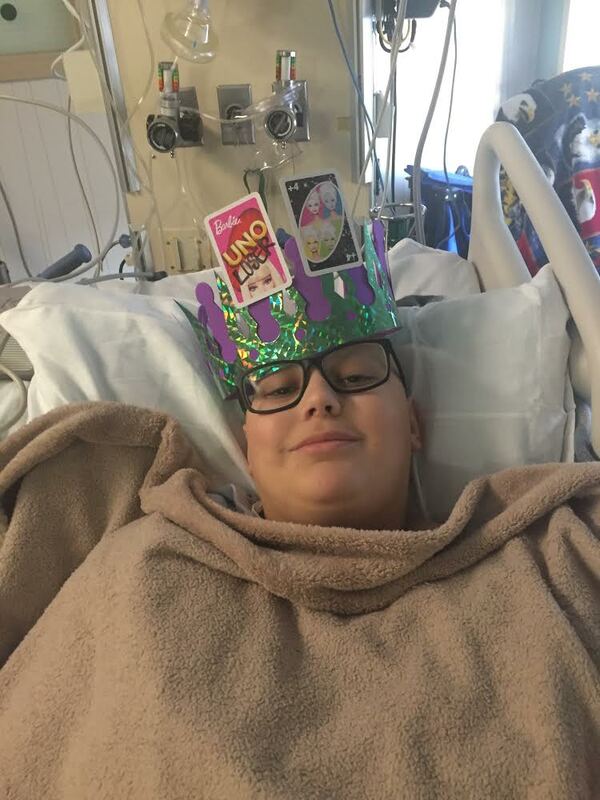 My 13-year-old son has been in the hospital almost exclusively since late March 2017. He has a rare form of cancer and needed surgery at UNMC. We have experienced numerous difficulties due to the nature of his unique surgery. I had left the hospital for a brief moment on Thursday, July 13th. I was returning to the hospital to try to meet my son and his team of doctors as they needed to head into yet another surgery. As I was running through the parking garage, my iPhone went flying. I had a screen protector on it, but the phone fell face down on the cement, destroying the screen protector and the phone screen. The phone was completely unusable due to glass shards and I knew I was going to need a phone to keep in touch with friends and family across the nation. Except now I had a broken phone that did me no good. I recalled seeing your store on Cass Street a few weeks ago. I called and explained my situation. I was told that your employee, Mason, would come to me. What is amazing response to a hysterical mom! Mason arrived within probably 20-30 minutes and called me when he arrived so I could come down to meet him. Mason was extremely professional and polite. He fixed my phone very quickly and I was able to make it back to pre-op with maybe 10 minutes to spare. My son is well known in the hospital due to the number and complexity of his surgery. He also is known for his singing during pre-op to get his surgeons and surgical teams dancing and ready to do their difficult jobs in the OR. Without my phone, I would not have been able to film him that day. Your company, and Mason specifically, literally saved our day. For a mom that spends a lot of time in tears at the hospital, your team brought a smile and joy to an otherwise difficult day. The surgeons were shocked to see me back in pre-op and were blown away that your company takes such good care of customers like me. A million thanks to you and Mason for a job well done." What the heck is Fair Repair and why should we care? It was exciting to see our sign go up! When we opened our new store on 144th in December, we debuted our brand refresh. Did you notice? We spiffed up our logo with the snazzy i. We locked down our color palette and created wall graphics. We also installed fun furniture to revitalize our store experience. Going forward all iFixOmaha locations will look as neat and professional as our customers deserve. Often our repairs are quick; we want your wait to be comfortable. What we love the most is that our mission statement is a part of our store graphics. Every customer can read what we stand for and our purpose in service. It reminds us daily as well. "All mobile devices repaired and protected by iFixOmaha where excellence is personified, customer and community compassion is the purpose, and business success is the plan." And we also like that our values are loud and proud as graphics too. We are soon snazzing up our Cass Street location, and the Papillion store will follow. We hope you enjoy our upgrades. Congrats to Lori Benton, our Director of Business Development, for leading this project and seeing it through to fruition. Many thanks to Raina Garcia and eSpark Media, Ron Revers with Revers Construction, Kent Jorgenson with Sign-O-Vation, Brittnie True with Vital Signs, and Stephanie Clark and Sahar Al-Turk with NAI NP Dodge for helping us bring our vision to life. Take a virtual tour of the new store, 4273 S. 144th, just south of Industrial. There’s been a sizable increase in concerned customers who might not have paid as much attention to charging/discharging habits of the batteries in their personal electronics. I’m going on the record to provide a consolidated FAQ of sorts. We are getting into the full swing of Fall Semester at the University of Nebraska at Omaha with our third iFixOmaha location - iFixUNO! Now students, instructors, and staff have the convenience of our smartphone, tablet, and laptop repair service right on campus inside the UNO Bookstore in the Milo Bail Student Center. iFixUNO offers a full range of mobile accessories and our service is fast and friendly. Same honest, fast, and reliable repair as our other two stores and iFixUNO gives discounts for donations, too. The Maverick Food Pantry receives all non-perishable food items and packaged diapers iFixUNO collects in exchange for 5% and 10% repair discounts respectively. We’re proud to be the repair choice of the Mavs and operate iFixUNO as an extended service of the University. Best of Omaha, 2016. Vote iFixOmaha! iFixOmaha’s been the name of the game since 2011, let’s show Omaha we have the popular vote. Vote iFixOmaha for Best of Omaha in Smartphone Repair! Omaha has come to trust this locally owned business to deliver the fastest, most reliable, and honest service. We're known for offering super fast turnarounds, a lifetime warranty on all parts and labor, and the lowest prices. Our company slogan, "Honest. Fast. Reliable." is often "borrowed" by competitors but living up to the promise is a different animal and that's exactly what we do. This is why iFixOmaha continues to grow and build upon good relationships forged with our customers through years of expert care and honest service. iFixOmaha customers can always expect to deal with a top notch professional staff offering fast repairs at bargain pricing... that goes without saying. iFixOmaha is now open in Papillion. Our second repair center is located across from the Shadow Lake shopping center on the northeast corner of 72nd and 370. In this blog post check out some great shots of the new location taken by our friend, Patrick Pfister.